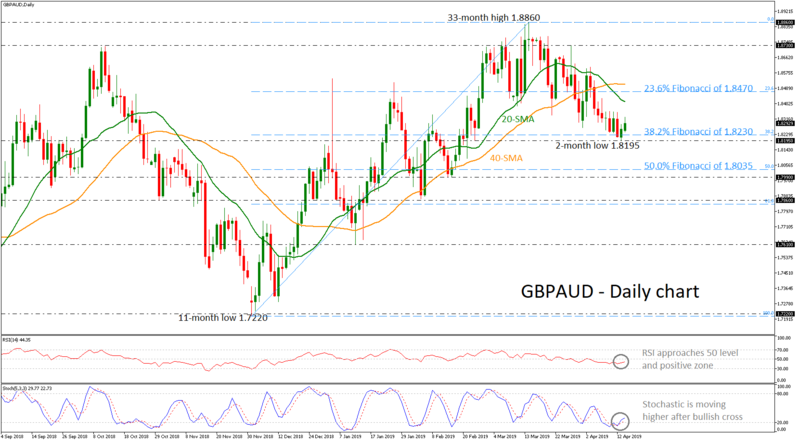 GBPAUD rebounded on the two-month low of 1.8195 on Monday, sending prices above the 38.2% Fibonacci retracement level of the upleg from 1.7220 to 1.8860, around 1.8195. The RSI is turning slightly higher approaching the 50 level, while the stochastic seems to be strongly bullish as the %K line and the %D line completed a positive cross in the oversold zone. On the upside, resistance could come around the 20-day simple moving average (SMA) currently at 1.8415 while next the price could flirt with the 23.6% Fibonacci of 1.8470. Higher still, the 40-day SMA around 1.8515 could halt bullish sentiment but a jump above this line, the 1.8730 resistance could attract traders’ attention. On the other hand, significant declines below the two-month low may meet support near the 50.0% Fibonacci of 1.8035 before edging lower towards the 1.7990 support. In the very short-term, GBPAUD seems to be in negative correction following the pullback on the 33-month low of 1.8860. If the price remains below the short-term SMAs, investors could turn their focus to the downside. Next articleCan you save money and the planet by owning a Tesla or another electric car?